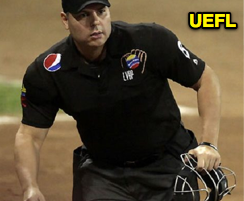 For the second year in a row, Jorge Teran captured the Venezuelan Professional Baseball League's Gualberto Acosta Award for Umpire of the Year. Teran, who previously served up an Atlantic League ejection in Somerset this September, following a Jim Evans Academy graduation and Minor League career up to Double-A's Eastern League (through 2016), has officiated in his home country's winter league for 15 years. Related: Jorge Teran Ejection (Kevin Baez) (9/22/18). Teran said he was surprised to win the LVBP's Umpire of the Year Award this season because nobody has ever won the award twice since its 2013 inception. LVBP umpire boss Miguel Hernandez credited Teran's game management and situation handling, complimenting his "tranquilidad y sangre fría," or calmness & cool blood. David Arrieta and Emil Jimenez rounded out the top three umpires in the 2018-19 LVBP. Previous winners of the league's Gualberto Acosta Award for top umpire include Carlos Torres (2013-14, MLB #37), Robert Moreno (2014-15, formerly MiLB-AAA [2017 International League]), Jairo Martinez (2015-16), Jose Navas (2016-17, MiLB-AA [2018 Southern League]), and, now, Teran (2017-18 and 18-19). 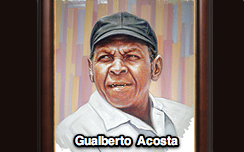 The top umpire award is named for Gualberto Acosta (1924-2008), who played catcher for the Navegantes del Magallanes from 1949 to 1956, later served as a Venezuelan umpire, and helped establish umpire schools in the country. He was posthumously inducted into Venezuela's Hall of Fame (Salón de la Fama) in 2008.